Pai believes in free markets and less regulation and has promised to “fire up the weed whacker” against net neutrality rules finalized under the Obama administration. Born to Indian immigrants in Buffalo, N.Y., Pai grew up a Democrat in a small town in Kansas. He graduated with honors from Harvard and received a law degree from the University of Chicago Law School. Pai later clerked for a federal judge in New Orleans, the Justice Department’s anti-trust division, and the Senate Judiciary Committee before joining the FCC in 2007. Five years later, Senate Majority Leader Mitch McConnell (R., Ky.) handpicked Pai as a Republican commissioner for the agency. The first FCC commissioner on Twitter, Pai is adept at using social media to shine a light on government overreach and cronyism. In addition to ending the FCC’s study into “perceived station bias” in newsrooms across the country, Pai helped end an offshoot of the Fairness Doctrine, an anti-free speech policy that required radio and television outlets to air opposing views on political issues. 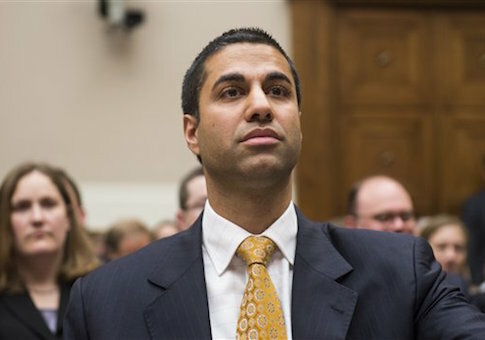 Pai also exposed how the FCC kept quiet about details of a $10 million fraud scheme in a cell phone subsidy program until the program was expanded. Additionally, Pai revealed how the “designated entity” (DE) program was perverted from its intended purpose during the Obama era. The program, designed to help small businesses compete in wireless auctions, was used to give discounts to Democratic donors. As chairman, Pai will prioritize policies to expand high-speed broadband, a move he said will boost the “American can-do spirit” in the digital age.